Herniated disc is a back pain diagnosis that can occur in any part of the spine and is a common cause of back pain. However, herniated discs are most commonly found in the cervical spine or the neck area as well as the lumber section of the spine or the lower back. This problem is commonly found in people between thirty and forty years old. However, this problem is not limited to only this age set it can occur in any age. In fact health surveys have shown that herniated disc can occur in teenagers, as well. The main cause of disc herniation is the natural process of growing older. As a human body grows older, the spinal column and the discs start to grow weak, less elastic and less flexible which in turn makes them extremely susceptible to injuries. Apart from age, other causes of herniated disc include injury from a fall, body weight, repeated straining, smoking as well as improper twisting or lifting of heavier objects. Usually not all patients suffering from herniated discs feel symptoms or signs that may indicate towards this problem. However, a person can feel back pain, neck pain, stiffness in neck and shoulders, numbness in limbs, as well as tingling sensation and weakness in muscle when a disc presses into a spinal nerve. 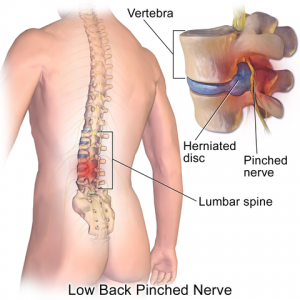 A patient suffering from lumbar pain from a lower back herniated disc will usually suffer from intense, radiating pain that goes down all the buttocks, legs and feet. Herniated disc in the cervical spine or neck are usually causes the patient to suffer from pain in one arm which can radiate to armpit, upper shoulder blade and trickle down to arms as well fingers. The patient can also suffer from upper back pain as well as headaches. Herniated disc treatment options include both non-surgical and surgical options for treatment. Pain management medications for herniated disc include NSAIDs, acetaminophen, and pain relievers as well as muscle relaxants. Non-surgical treatment options usually include physical therapy as well as chiropractic care and physical therapy.